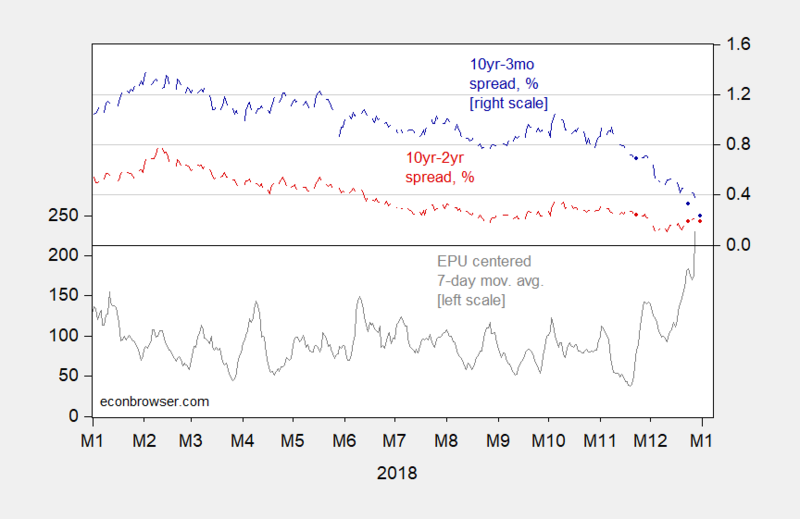 Figure 1: Baker Bloom and Davis Economic Policy Uncertainty index, centered 7 day moving average (gray, left scale), and ten year – three month Treasury spread, % (blue, right scale) and ten year – two year spread, % (red, right scale). Source: policyuncertainty.com, FRED and author’s calculations. This entry was posted on January 1, 2019 by Menzie Chinn. : ) At least donald “Orange Excrement” trump hasn’t ruined music yet. Not too long to the Chinese New Years Menzie. Wish I could wish your Mom a Happy Chinese New Years when that time comes. Just tell her some degenerate who reads your RSS feed was thinking of her and to make sure she had her noodles and egg whenever her birthday is. With the stock market already down sharply this indicator doesn’t look so timely this time. spencer: I think yield curve is a bit more reliable, though. And we all know that Honest Don would never tell a lie. Just ask Rick Stryker. This must be another glitch. Trump said yesterday that the stock market has increased by 30% since he was elected but the S&P 500 is reporting only a 15% increase. FAKE Wall Street! Regarding the EPU data, the only daily data downloads from EconomincPolicyUncertainty.comI that I see are titled below. Are you using one of these categories for your average calculation? The “Full Daily Updates Data” seem to require some manipulation prior to averaging. Also I can’t recall if you presented a model relating economic uncertainty to S&P 500 returns. AS: I just take the daily series (latest vintage, so this was 1/1/2019) and lead by 4 days, and take 7 day moving average. This is likely just the Border Patrol headcount. It excludes bodies located by other entities, for example, local police. It excludes bodies not found, of course, and bodies on the Mexican side. By our count, 400 bodies reported by Border Patrol translates into about 1,100 deaths in the border crossing. This excludes migrants killed within Mexico outside the border zone, for example, falling off the death trains or killed during kidnappings. It is about far more than the heart-wrenching stories of the Jakelins. @Steven – you write like this is some kind of revelation to you. Migrant deaths along the Mexico–U.S. border occur hundreds of times a year because of those attempting to cross into the United States from Mexico illegally. The US Border Patrol reported 294 migrant deaths in the fiscal year 2017 (ending September 30, 2017), which was lower than in 2016 (322), and any year during the period 2003-2014. Exposure (including heat stroke, dehydration, and hyperthermia) were the leading cause. The group Border Angels estimates that since 1994, about 10,000 people have died in their attempt to cross the increasingly militarized border. According to the U.S. Customs and Border Protection, 7,216 people have died crossing the U.S–Mexico border between 1998 and 2017. In 2005, more than 500 died across the entire U.S.–Mexico border. The number of yearly border crossing deaths doubled from 1995 to 2005, before declining. The statistics reflect only known deaths and do not include those who have never been found. Perhaps our border patrol agents shouldn’t be dumping out canteens of water onto the dirt. You closing sentence is spot on. Maybe we could spend that $5.6 billion on alleviating this problem rather a stupid wall. We can alleviate the problem at a $30 bn profit annually. We could if we first get rid of the Idiot in Chief. Speaker Pelosi just took the gavel. At least common sense will rule the House. Curiously, I think Trump is the only President who would see such legislation passed. Nine Presidents since 1965 have ignored the problem, because that’s the stable political equilibrium. I doubt any of them would have considered a straight-forward commercial approach, which is the essence of market-based visas. Trump could, but I doubt any successor would. Most likely, we see halfhearted attempts to increase enforcement over time — just as we have seen — with no real progress. The status quo could easily persist for another fifty years. That puts those predation numbers into stark relief, I think. Pretty big stakes, actually. Border Patrol only catches about one-third of deaths. That’s the revelation for you. For predation in aggregate, I believe we have the state of the art in the business. If you are interested how we calculate these numbers, click on the excel file linked at the site below. It will take you to the ‘Death’ tab, which shows both the formulas and the sources we used to create the model. Peddling your fake research again? OK – at least time you are not low balling the number of deaths the way you did with those who died in Puerto Rico. steven, were these actual deaths or simply accelerated deaths? if they were elderly or very young and weak, perhaps they would have died anyways and this event simply sped up the process. those should not count. we can use your hurricane maria methodology to eliminate deaths not directly attributed to the act of crossing the border. These were absolute deaths. Those coming across the US border are typically 18-32 years old, just starting out their adult lives. Preventing deaths associated with hurricanes is hard. The Hurricane Maria would have flattened the grid in PR one way or another. Maybe you save a few hundred lives (primarily of the infirm and aged, yes), but it’s hard to do. With migrants, we are speaking of 1.2 million cases of predation in 2018, including perhaps 2500 deaths, which will keep on going and going forever. And we could end it in two years, easy. And moreover, the incremental net revenues to the US government, were they capitalized as equities on the NYSE, would create an entity that ranks No. 4 on the Fortune 500 list. That’s not hard. It’s not heroic. It just involves applying basic theory as proven over decades in practice.